Alan Pardew says Newcastle United need a bigger squad | NUFC Blog. Alan Pardew reflects on Newcastle United’s defeat at Anfield, suggesting where we failed and what can be done to improve matters next season. “I thought the second goal was crucial in the game because after a fast start by Liverpool where they got the goal, we played well in that period and we took the emphasis away from Liverpool in terms of their exuberance and their movement. “We kept the ball, we were patient, we couldn’t quite find that moment from a set play or a cross to get ourselves a goal before half time, but straight after we had a chance with Joey and normally I would expect him to score that. 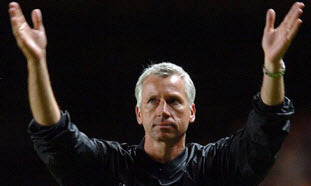 I get the impression that Pardew wasn’t too happy with Williamson’s mistake and feels it may have cost us the match. He may be right. “Our strikers and our attacking players could be improved and we have to work on that for next week but we had some good performances on the day. He’s hit the nail on the head re the strikers. I have in the past been an apologist for both Ameobi and Lovenkrands, arguing that they need time and first XI starts in order to shine. Then, just as my patience runs out with them, one or the other would score and put me back on the fence again. No longer though. I don’t think Ameobi or Lovenkrands have what it takes to lead the line up front and I don’t think they ever will. They are (IMHO) squad players and we need two quality strikers as a matter of urgency in the summer. Incidentally, what was the point of Kuqi? I know he was only a short-term, stop-gap loan but I have no idea what he’s capable of given that he only gets at the most 10 minutes a game to do anything. “I’m not going to focus too much on our positive play because we were beaten 3-0 but we will have to bounce back, particularly for our two home games which will be important for us. “We’ve got two games that are winnable and a tough one against Chelsea so we’ve got a nice mixture of games. “The spirit in our group is fine and the effort they put in was honourable today but we lacked a bit of quality. “I think we’ve got a good base to work from. We’re under no illusions. We can’t go into the season with this size squad. Quite so, although time will tell how deep a squad Ashley allows Pardew to build. Sunday afternoon stroll ends in defeat. This summer will be crucial for us. We cannot afford to lose any first team member and have to improve our squad in term of Quality and quantity also. I still confident we can make the good team to challenge Europe position but we need some ambition for Board and absolutely ASHLEY. P.S. Where’s Best now ? i know he still injure but doesn’t he stay with team ? Just like he disappear from our squad. May he should stay on our line-up next season ? “Our strikers and our attacking players could be improved and we have to work on that for next week but we had some good performances on the day…..
not one shot on liverpool’s goal – f@cking disgraceful. what was pardew saying about shola last week? summit aboot him being one of the best fowards he’s ever managed – whey aye man owt ya say. & who’s he referring to regarding – some good performances on the day??? this bloke must think we’ve just come up the tyne in a biscuit tin. i predict we wont get another point this season. We were shite. You can’t polish a poop Pards. I’m glad he’s still pushing the “we need a bigger squad” line though. Let’s hope it isn’t falling on deaf ears. yep, tavernier and fergison looking good for next season,think them two young lads will be on tyneside for a while as they are very good tallent coming through.like to see them both play the next games,simmo and willo should watch out!,like to see ranger get a chance at a full game also….. So Pardew thinks we need a bigger squad, wow ! Look we got one guy up front who looks like a keeper, Best, the others, including Ranger, deadwood ! Finally Williamson has proven to be highly over-rated,if you did`nt like Titus Bramble,well…..
we are hearing about the real targets, Snodgrass,Wanyama,Gradel and Puncheon what happened to Gervinho,Gamiero,Kranjcar,Taiwo and the likes ? You got it, nothing changes, same old game, “bait and switch” a game well known to every retailer. I guess i should just stop moaning and get behind the team, aint that the usual prescription given to moaners? Pardew does seem to be something of a ‘genius’ when it comes to making inconsistent statements. He just seems to react in the moment without having any consistent thinking in where he want’s his squad to go. right,next celebrity mastermind,i’m entering alan pardew,he’s a f**kin’ shoe in to win. his specialist subject can be “the life and times,of an a**e crawler”.i wouldn’t mind if the bloke had anything constructive to say,but day in day out,the same drivel. “we lost the game today,because of the refs haircut”the s**ts getting old noww ffs. another story in tonights chronic,about nile ranger repaying the faith pardew has in him.who’s ranger trying to kid?so far he only looks like he’s had a drink with a footballer. it’s been the same old,same old since ashley arrived,we’ve got a s**t squad,but hey we’ve spent a load of money on a new training pitch.our pitches must be the greenest in the country,due to the crap that plays on it,week in week out.”we are moving forward on and off the pitch,with the naming rights for the stadium up for sale”hows that one going mike?seems like your the only one doing well out of that,you f**kin’ conman. “who needs messi,when we’ve got shane long!!”. Trojan, I wouldn’t say we’ve got a “s**t’ squad, I wouldn’t say we’ve got a great squad. I’d say that we have a mid-table squad which has been suffering from more injuries than there needs to be because of some players being rushed back too soon. Of course though, it’s a question of what you expect the squad to be under our present circumstances. judge him on next season. worky,i was speaking” metafossfoly an’ aal that lol. i didn’t really mean to imply,that all our players are s**t,just that the squad is weak,and pardews constant drivel,tries to steer that glaring fact away,with torrents of crap.the bloke never shuts his s**t up for more than two minutes at a time. thump,i am in a foul mood,as i have fluid on my nads,and they have swollen to titanic proportions,like that kid in the viz.i can barely sit doon lol. GO Pardew!! Get a bigger squad and some good players so we can come to europe league!! worky,they are a canny size,been to see about them today,nice little procedure to drain them off. Trojan, I’ve had alot of things, but I can’t say I’ve ever had watter on me knackers! Are they as big as this? Fact is we do have a few decent players to build a side on, but a pretty small group. Our goalies are fair, nothing special. The rest, sell em, not PL quality or over the hill. Thats seven (Counting Ferguson as a winger) midfielders. So you can see where we need to strengthen, up front and the defense. Would like to see a decent striker or two, a replacement for Enrique, another CD, perhaps Arry will sell us Bassong. Two full back backups and i wouldnt mind Ireland. Hey just a wish list but we will i`m sure still have Smith, Guthrie and Williamson and Lovenkrands, come next seasons beginning. worky,i wish you hadn’t put that up,i’m getting worried now lol.